- Do not use the strike variant bomb pylons on the Tornado ADV. 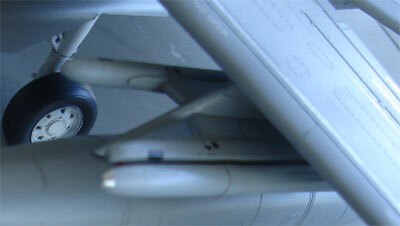 - The special pods ECM and BOZ may be used and fitted on the Tornado ADV. You may slightly modify the BOZ pod to get the Ariel Towed Radar decoy fitted on operational F.mk.3 planes. - The Harm missile is not used on the Tornado ADV. - The Sidewinder missiles were usually seen on Tornado ADV in their older days when put into service, these are in the kit. Skyflash Air to Air missiles are also used on ADV's but are not in the kit. They look like Sparrow missiles deployed on F-4 Phantoms and F-15 Eagles, look for some spare 1/32 missiles in other kits or your spares' box. Remove their upper fins and fit two flat sanded missiles below the forward fuselage to fit them in the forward recesses. The two rear missiles can be put simply in place within upper fins. After 2005, all ADV F-3 aircraft had an systems upgrade that enabled the armament with AIM-120B AMRAAM and after mid 2005 AIM-132 ASRAAM missiles. The AMRAAM was to replace the Skyflash and the ASRAAM the Sidewinder missiles. In 1/32 scale, the Tamiya F-16 has AMRAAM missiles; I have a few left, so will use these, leaving off the (recessed) fins to fit below the fuselage. 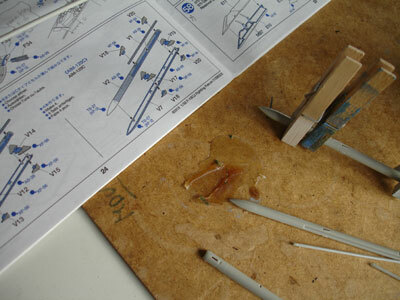 The missiles for the forward under fuselage recessed areas were sanded flat on top before putting them on the model. The rear missiles were added as is (but without their top fins). In 1/32 scale, I do not know of any AIM-132 ASRAAM missile in kit form. 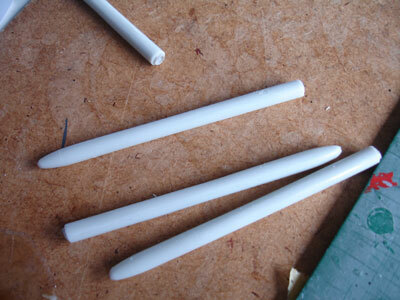 I have seen testshots of the announced 1/32 Revell Eurofighter and it will have these in the kit. 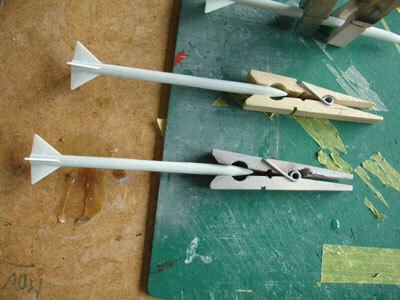 I made decided not to wait and to make these from scratch, using bodies of other spare missiles in the spares box. [Info here on FAS]. Their small fins were made from card. Missiles were painted light grey and some simple stripes added with a pencil. For the ASRAAM I used the new resin outboard pylons. Views of the completed model. The Tornado ADV F3 model is now completed... a nice one for the 1/32 collection in addition to my very old converted ADV F2.